This stainless steel viognier is characterized with a classic tropical notes of pineapple, kiwi, passion fruit and a touch of peach. Next to the tropical notes is a pleasant floral character that is enhanced by a touch of lavender. 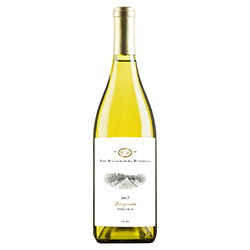 The wine is very clean and bright and offers a fruit forward sensation on the palate. Mt. Juliet Vineyards Viognier was harvested on 05 September at 23.3 brix, 3.87 pH and 4.54 TA. Amrhein Vineyards Viognier was harvested on 11 September at 20.6 brix, 3.52 pH and 6.81 TA. Mt. Juliet Viognier was fermented in stainless steel with Rhone 3600 yeast for over 1 month. Amrhein Vineyards was fermented with BA11 yeast in stainless steel for over 1 month. Both Viogniers did not receive any ML inoculation.